Choose how you are hosting your Wordpress blog. The options are Wordpress ( you signed up for a subscription plan from wordpress.com ) or Self Hosted ( you downloaded and installed wordpress on your existing web host ). The site name assigned you used to setup your Wordpress.com subscription. For Example: Our Wordpress site is yabdab.wordpress.com, so our site name is "yabdab". The URL of your self hosted Wordpress site. The type of page we are going to build. The 2 choices are "All Posts" and "Single Post or Page". The page will include a complete list of all published Wordpress posts. The layout on where you would like the sidebar to be positioned. The sidebar can contain a Search input, Category List and Tag Cloud. Choose "None" if you do not want to include a sidebar. The date format you would like publish dates. We use the PHP standard date formatting placeholders. For more information on PHP date formatting, please se the following URL. Include a full list of Categories in Sidebar. Include a list of tags from all your Wordpress posts in Sidebar. Include a search form to find matching posts to be displayed in Sidebar. The title of each post or page will be displayed . The publish date of each post or page will be displayed. The categories of each post or page will be displayed. The tags of each post or page will be displayed. The page will display the data from a single specified post or page. Are we displaying a Post or a Page from Wordpress? The identifying slug associated with the post/page that should be displayed. An example slug could look similar to "my-first-post". The stack provides a super easy way to share your Wordpress posts using the popular and Free +AddThis service. Click checkbox to enable sharing via the AddThis service. The profile ID from AddThis that will be used to share your posts. When setting up your AddThis profile, you will need to setup a Inline sharing "Tool" inside the AddThis dashboard. How you would like to style the output of the stack. How would you like to style the elements output by the Wordpress stack? 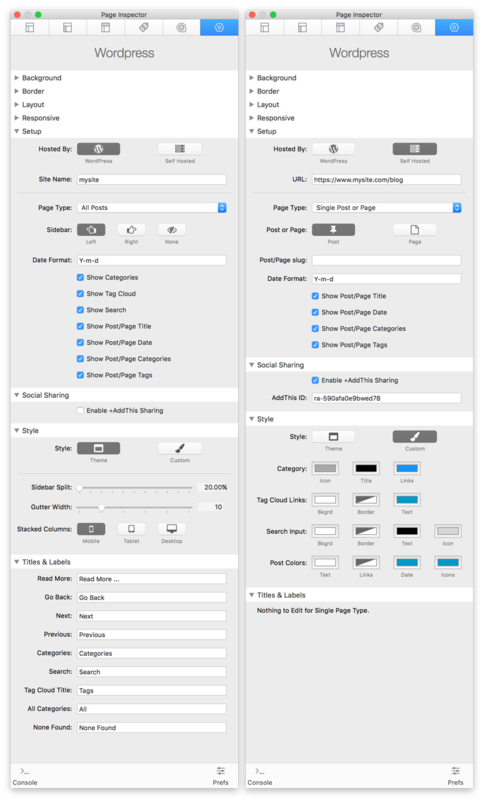 Theme - Use the styles set by the selected RapidWeaver theme. Custom - Set specific colors for all elements. Use this slider to establish the width for the sidebar. The amount of space between the sidebar and the content area. When should the stack display the sidebar and content columns top to bottom, instead of left to right. The text you would like to use for different titles and labels output by the stack. This provides a super easy way to localize the text to suit your needs. Please Note: These settings only apply if the Page Type ( see above ) is set to "All Posts". Do you provide Support for installing and setting up Wordpress? No, We do not provide support for setting up self hosted copies of Wordpress from Wordpress.org. You should contact your web host or read the excellent documentation for help with this. What kind of Wordpress content can I expect to be imported via the Wordpress Stack? Can I use the WordPress Stack multiple times on the same page? Yes, you can use it multiple times if you are using the "Single Post or Page" Page Type. No, you cannot use it if using the more than one "All Posts" Page Type.